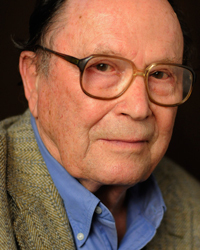 Richard Wilbur is among the singular poets of our time, the only living poet to have twice won the Pulitzer Prize, and a former Poet Laureate of the United States. As a young veteran of World War II, Wilbur became friends with Robert Frost and Wallace Stevens and began writing the refined and rigorously optimistic poetry that characterize his sixty-year oeuvre. In the 1960s, Wilbur and his wife Charlee began spending winters in Key West, where he became friends with a circle of poets including James Merrill, John Ciardi, and John Malcolm Brinnin. In January 2010 we welcomed Wilbur back to Key West with Clearing the Sill of the World, our 28th annual Seminar, held in his honor. In this recording from January 9, 2010, Wilbur reads more than two dozen poems and translations, many of which would be published by Harcourt that fall in his 10th collection, Anterooms. These new poems include “The House,” “A Measuring Worm,” “Flying,” “Trismegistus,” “The Censor,” “Out Here,” and several new translations of riddles from Symphosias (“Nine lives I have…,” “I have no tresses…,” “Through middle air…,” “All things I powerfully crush…,” and “A god’s sweet mistress…”). He reads “Security Lights, Key West” from the 2004 New Poems as well as “Nuns at Eve” by John Malcolm Brinnin, for whom the Seminar’s Saturday evening address is named. From Mayflies (2000), Wilbur reads “For C.,” “Crow’s Nests,” a translation of Valeri Petrov’s “A Cry From Childhood,” and “This Pleasing Anxious Being.” From 1987’s New & Collected Poems, we get “The Ride,” Vinicius de Moraes’s “Song,” and “Hamlen Brook,” while from 1976’s The Mind-Reader we get “The Writer,” and the comic poems “Piccola Commedia,” “To His Skeleton,” and “The Prisoner of Zenda.” Wilbur continues this survey with “Complaint,” from Waking to Sleep (1969), and “Advice to a Prophet,” from the eponymous 1961 collection, before concluding with several pieces from one of Wilbur’s books of light-hearted verse for children, The Disappearing Alphabet.